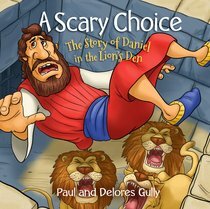 About "A Scary Choice: The Story of Daniel in the Lion's Den"
PAUL GULLY, an identical triplet born on Christmas Eve, started drawing at a very young age. Influenced and encouraged by teachers, Paul made a decision to illustrate and write for a living. After attending art school in Sarasota, Florida the whirlwind of art jobs began. His portfolio includes yellow page ads, Tampa tribune ads, a Children's Bible for the American Bible Society, and thousands of illustrations for ministries around the world. He also managed a computer graphics company, and has done art directing/producing for Philips and Samsung, Paul and his wife, Dee, have a love for children that has taken them on many adventures and mission trips. They currently reside in Dillard, GA.
Paul and Delores Gully are known for their cartoon children's illustrations which are being used worldwide to preach the Gospel to hundreds of thousands of children. Their hope is for children to know who God is and know how much He loves them.